Did you get a letter in the mail from the IRS? Has the IRS informed you that you owe more than you already paid? It can feel frustrating and nerve wracking to owe more than expected—especially when you’re already doing your best to save money and spend it on the important things. Unfortunately, you’re not alone in this situation. Millions of Americans every year take on the IRS, and, unless they have professional representation, they lose. It’s imperative you find an experienced, knowledgeable criminal tax attorney to help you. 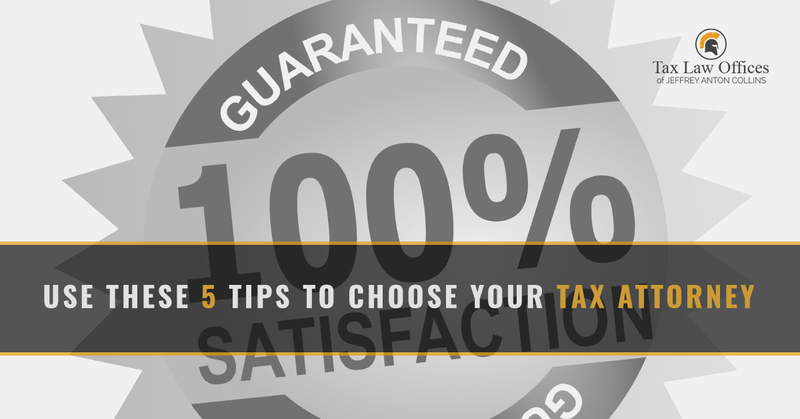 In this post, we’ll share the five tips to find and choose the best Illinois tax attorney for your situation. Ready to discuss your tax issues now? Call Tax Law Offices in Naperville now! Until then, read this post to learn more. Do your due diligence and research knowledge, experience, reputation, and results. You want a tax attorney in Naperville that will take care of you. Do not wait to contact the IRS. The sooner you communicate with them the better the outcome will be (compared to ignoring them entirely or waiting to pay them). Your tax relief attorney should work to get you on a payment plan or at least in communications to appeal your tax obligation if doesn’t match your records. The “wait it out” strategy is not effective. The IRS has very specific, strict processes for tax relief. Whether you’re aware of this or not, the IRS is not flexible. You have to follow their guidelines, procedures, and protocol to get anything through to them or returned from them. If your tax attorney promises something too good to be true, it’s probably false. Check sources and ask questions as often as you can. Although money back guarantees are great protection to your investment in resolving your tax issues, they rarely work. Most tax relief attorneys that offer this never intend to give your money back. Frankly, they’re not legally obligated to if they provided the service you paid for. Don’t let the money back guarantee give you a false sense of security. Finally, know what you’re paying for. Read the fine print. Understand the pay structure. Just because you give someone money doesn’t mean it’s time to close your eyes and hope for the best. Stay diligent, ask questions, and make sure you’re getting the tax relief services you’ve paid for. In some cases, companies will charge you before doing anything as a consulting fee. Make sure you know if that’s the case, or if you’re being given a complimentary consultation to win your business. After years of helping clients find tax relief, Tax Law Offices in Naperville know what it takes to reduce tax liability, even in the worst tax debt situations. It can seem impossible to deal with the IRS alone. We strongly encourage you to call a local criminal tax attorney to help you find relief. Ready to discuss your tax issues? Call us today!